Spring Allergies…What Are They Exactly? 11 Apr Spring Allergies…What Are They Exactly? Allergies can make you really miserable. But, what exactly are they? “An allergy is when your immune system reacts to a foreign substance, called an allergen. It could be something you eat, inhale into your lungs, inject into your body or touch. This reaction could cause coughing, sneezing, itchy eyes, a runny nose and a scratchy throat. In severe cases, it can cause rashes, hives, low blood pressure, breathing trouble, asthma attacks and even death. There is no cure for allergies. You can manage allergies with prevention and treatment. More Americans than ever say they manage allergies. It is among the country’s most common, but overlooked, diseases,” the Asthma and Allergy and Foundation of America (AAFA) said. 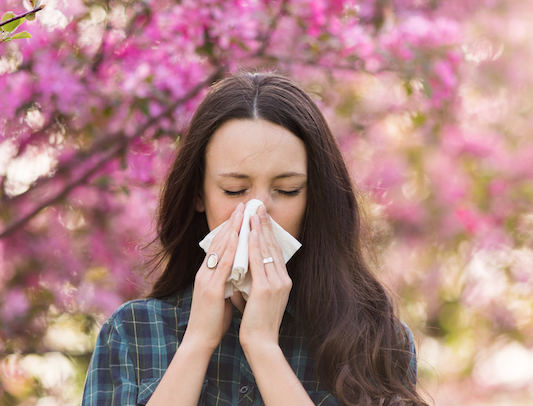 How Many People Are Affected by Spring Allergies? Draw strength from knowing that if you suffer from spring allergies, you are not alone! Watch out for the following signs and symptoms to know if you are suffering from allergies and then give us a call to get help–there is no need to stay uncomfortable! Sometimes, the allergen that you may be reacting to is closer to home. Indoor AND outdoor allergies can trigger sinus swelling, hay fever and nasal allergies. Most with allergies often have more than one type that is causing them issues. The most common indoor/outdoor allergy triggers are: tree, grass and weed pollen, mold spores, dust mites, cockroaches, and cat, dog and rodent dander. “When a harmless substance such as dust, mold, or pollen is encountered by a person who is allergic to that substance, the immune system may overreact. It may produce antibodies that attack the allergen. These can cause wheezing, itching, runny nose, watery or itchy eyes, and other symptoms,” said the University of Rochester Medical Center. Getting help your immune system so it doesn’t trigger these unwanted side effects is of prime importance for restoring you to your prior health and well-being. “For many people, avoiding allergens and taking over-the-counter medications is enough to ease symptoms. But if your seasonal allergies are still bothersome, don’t give up. A number of other treatments are available. If you have bad seasonal allergies, your doctor may recommend that you have skin tests or blood tests to find out exactly what allergens trigger your symptoms. Testing can help determine what steps you need to take to avoid your specific triggers and identify which treatments are likely to work best for you,” the Mayo Clinic said. If you think you have an allergy, let us help you–through testing–to know for sure. When you know your body can’t tolerate something, you can make adjustments to stay feeling your best. Some allergies can also be treated with immunotherapy. To make an appointment, or to learn more about our state of the art facility and team, contact us at (720) 507-0080 today to schedule your free consultation at our Broomfield chiropractic office!